Rails? Check. Grip? Check. Free floating? What? The standard AR-15 carbine comes with a useful if not boring 2 piece plastic handguard with aluminum heat shields. It's light and cheap and thats about it. Fortunately, the standard handguard is also easy to remove and replace, and the current AR market has an abundance of railed handguards for shooters. A quality railed handguard is probably one of the most expensive upgrades that the majority of shooters will add to their AR. Some of the top manufacturers producing railed handguards have about any configuration you can imagine for a price range of around $100-$400. When it comes to selecting an appropriate handguard for your rifle and your needs, there are a few points to consider. I believe there are none more important than choosing a free-floating rail as your new handguard. Why? Not because it offers such a huge advantage over the standard handguards in accuracy, because it doesn't for the majority of shooters. My reasoning is simply because, if I am going to spend several hundred dollars on a new handguard for my rifle, I expect it to offer every advantage it can, including a small if minimal improvement in accuracy. If I dont want rails or a new handguard, then I am content with the standard non-floating handguards realizing that my rifle's accuracy is most dependent on what I DO as the shooter. Thus the advent of free-floating handguards. Free-floating handguards simply mean they do not touch or add force to the barrel anywhere (in theory). Some free-floating rails may slightly contact the barrel at the barrel nut or Delta ring, but touch here is negligible since the barrel is attached to the upper receiver here and movement of the barrel is impossible. Some free floating handguards may have end caps toward the gas block which appear to touch the barrel slightly. I've never really liked having one of these on my rifles and don't use them with my rails. The position and function of the gas block and gas tube does not add any untoward force to the barrel during shooting. If anything, the rigidity of the gas tube and its attachments to the gas block and upper receiver adds a small amount of stability to the barrel to help prevent flexing during repeated shooting. A true free floating rail should also not touch the gas block or gas tube either, for the same reasons listed above (causing peripheral forces on the barrel). Eliminating any unwanted forces on your barrel as the advantage of improving your accuracy, particularly at distance. A small force touching your barrel which flexes your muzzle even a tenth of an inch is multiplied greatly at 300 or 400 yards, meaning your shots can go inches or feet off target. This is where I feel a free float rail is really an advantage. A high quality rail with a secure attachment (dedicated barrel nut), rails or ability to attach rail pieces, and free floating qualities are an "essential" part of my AR-15 rifles. Having the ability to attach a sling, light, and handstop or forward grip are primary objectives when I am customizing a rifle, and a quality, aluminum handguard with rails or rail attachment points fits the bill perfectly. Being lightweight is another important thing to consider when choosing rails, as most quad-rails weigh at least 10-15 ounces. Free floating rails typically are made of aluminum and are also better heat-sinks than the plastic handguards that come on AR-15 rifles. 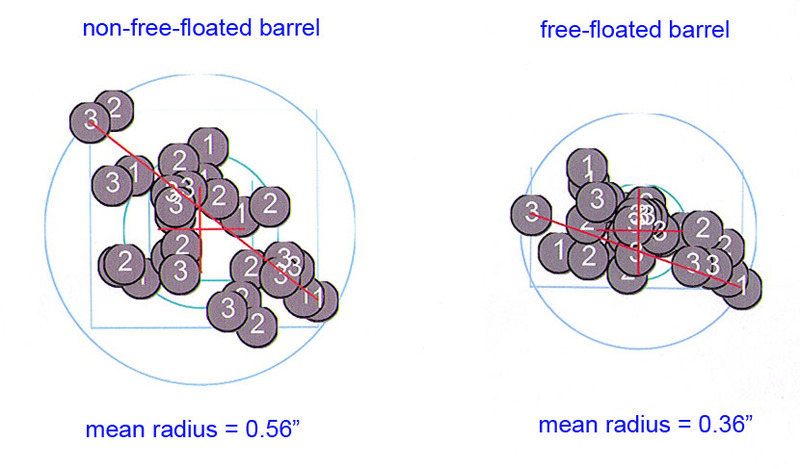 Under repeated fire, a hot barrel will become less accurate as it heats up. So, it would follow that keeping your barrel as cool as possible will be better for both accuracy and the skin on your hands. This is an advantage that a lot of people don't realize when they add an aluminum free-float rail, but in my opinion is as important or more important than the accuracy improvement. If you are looking for a new railed handguard for your AR-15 rifle, hopefully this information about free floating rails helps before you make your final decision. I'm a big proponent of free-floating rails IF the handguard is going to be replaced. Otherwise, become proficient with your standard AR-15 handguard if it accomplishes the purpose for your rifle. Check out Strongsidetactical.com if you are looking for a new free-floating rail for your AR-15.